“You may be a victim of software counterfeiting.” These messages pop up regularly if Windows thinks you’re using a pirated version of Windows. Microsoft wants to nag you until you go legitimate and prevent PC sellers from sneaking pirated copies of Windows onto their PCs. Microsoft recently announced that Windows 10 would be a free upgrade even for computers without genuine copies of Windows. But, even though they’ll let you install Windows 10, you’ll just end up with a non-genuine copy of Windows 10 that continues to nag at you. Windows includes a process known as “Windows Activation.” This process activates your copy of Windows with Microsoft, and they check to make sure it’s a properly licensed copy. It ensures your Windows license key is only being used on a single PC at a time and that thousands of PCs aren’t using the same key. Windows also regularly checks to ensure that your key hasn’t been reported as pirated. This occurs when your computer tries to download optional updates from Microsoft — something that normally happens as part of the standard Windows Update process. 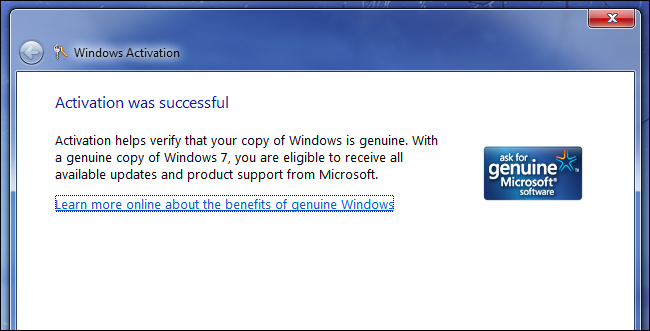 A typical Windows PC you buy will come with a pre-activated copy of Windows that’s properly licensed. This is only something you have to worry about if you build your own PC or upgrade to a different copy of Windows — if you install Windows yourself, in other words. If you purchase a used PC or another pre-built PC from a local computer store and see messages saying Windows isn’t genuine, they stuck you with a pirated copy of Windows to save money. That’s a big part of the point of the message — to make pirating more difficult for the pirates and have messages that let users know whether their computer has a pirated copy of Windows or not. A non-genuine copy of Windows has features designed to regularly alert you to this and annoy you into wanting to use a properly licensed copy of Windows. Windows XP and Vista had harsh limitations here, Windows XP had Windows Genuine Advantage pushed as a Windows Update, and that could potentially lock users out of their computers. Windows Vista relaxed things and offered a “reduced-functionality mode,” which only let you log into your comptuer for an hour at a time. Before Service Pack 1, Windows Vista’s reduced-functionality mode only let you use Intenret Explorer for an hour at a time. Windows 7 softened things even further, and they stayed softened in Windows 8 and 8.1. When you’re using a non-genuine copy of Windows, you’ll see a notification once every hour. The notification informs you it’s non-genuine and that you need to activate. Your desktop background will become black every hour — even if you change it, it’ll change back. 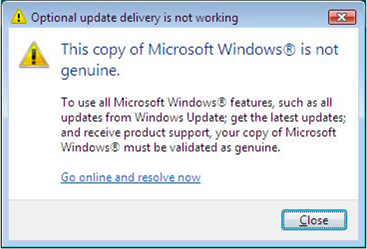 There’s a permanent notice that you’re using a non-genuine copy of Windows on your screen, too. You can’t get optional updates from Windows Update, and other optional downloads like Microsoft Security Essentials won’t function. Windows 8 limits some other personalization settings, including preventing you from changing your Start screen background. Microsoft also won’t offer you phone support and other help for Windows if you haven’t paid them for your copy. This sounds obnoxious — and it is — but let’s list the things that continue working normally instead. You can continue using your computer, and all the applications will function normally. You’ll never be locked out of your computer. You’ll receive important security updates from Windows Update to keep your computer secure. The messages are obnoxious, but they at least let you continue to use your computer. If you have to deal with this problem, at least you can continue using your computer in the meantime. So, how do you go genuine? The current messages don’t provide an easy way to purchase a legitimate Windows license and get it onto your PC. Instead, you’re encouraged to purchase a new PC with a properly licensed copy of Windows or buy a boxed copy of Windows and install it on your PC. If you do actually have a valid Windows key, you can change the product key in Windows. Windows will then activate with Microsoft and remove the limitations. That’s something MIcrosoft seems to be working on with Windows 10, hence why they want to make it easy for all those non-genuine copies of Windows to upgrade. Microsoft says there will be an easy process to buy a genuine copy of Windows in the Windows Store app and have the PC automatically repair itself to make sure everything is secure. If getting rid of all those nag screens just requires a few clicks and a credit card number, no wonder Microsoft wants to encourage pirates to upgrade! Yes, there are obviously tricks Windows pirates use to bypass the genuine Windows notification. Microsoft is in a constant battle with those tricks, and has been for as long as Windows has existed. We’re not giving any advice on tricking Windows into thinking it’s genuine here. Hopefully, Microsoft will reduce the copy of a Windows license to a place where it’s just worth paying for to avoid the hassle. At $200 for a professional edition of Windows 8.1, the price is a bit high for many people.